I made some super easy cookies using cake mix and pie filling last week. Did you see it? I called them Cakies and they’re soft, spongy cookies that are absolutely perfect for this new recipe because they freeze perfectly. 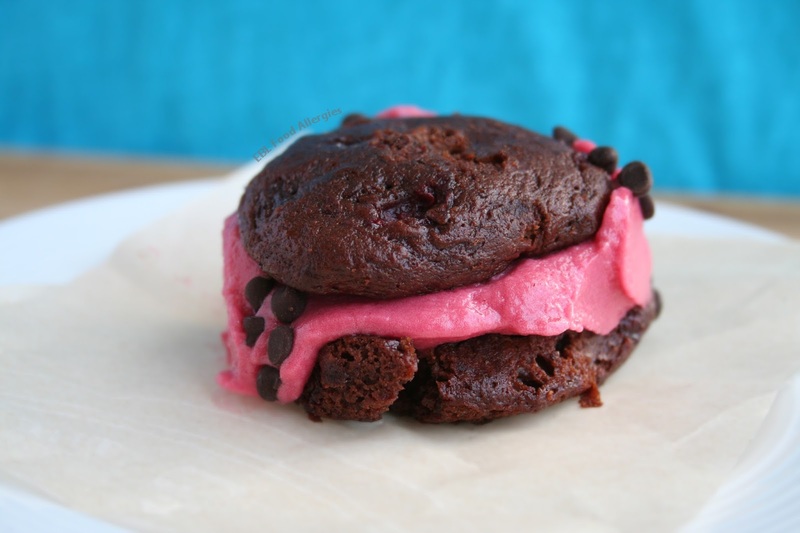 Cakies create the absolutely perfect texture to use for frozen Vegan Sorbet Cakie Sandwiches. They don’t crumble and fall apart. They don’t break your tooth with hardness. Instead they create a frozen pillow of cookie cakeness (is that even a word?) perfect for holding your favorite frozen treat. Of course I only came up with the idea when I had only three cakies left from the last batch that I made. So this lonely Vegan Sorbet Cakie Sandwich was the one and only of it’s kind. That’s okay though because it didn’t last long. My son DEVOURED it for dessert that night, which meant one thing. I needed to make more! Any type of frozen dessert must of course come with chocolate chips. Isn’t that some type of known fact? It is in my book! After sandwiching the sorbet between the frozen Cakies I decided to then roll the sandwich in dairy free chocolate chips. Mmmmmmm,,,, don’t even get me started… soooo freakin good! Print FULL RECIPE (including the recipe for Cakies) here! Microwave the sorbet for about 20 seconds to soften it up and remove Cakies from the freezer. Using a 2 Tbsp spring loaded scooper, scoop sorbet onto frozen Cakie. Press the other Cakie onto the sorbet and slowly sandwich together. Pressing gently, roll the sandwich onto the chocolate chips until covered. Move the Cakie sandwiches back to the freezer for about 30 minutes to harden up. I chose to cut the sandwich into pieces to easily pop into your mouth without having to bite into a cold frozen sandwich. 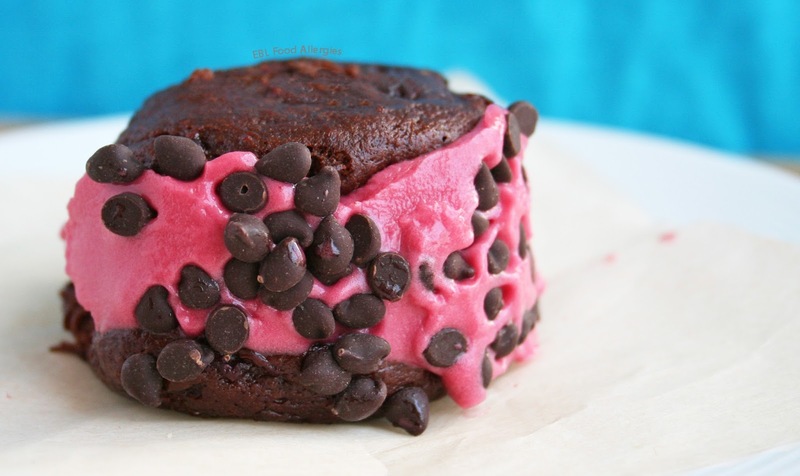 If you like this recipe you may also like Easy Dairy-Free Ice Cream Cake or Single Serving Dairy-Free Mini Ice Cream Cakes.